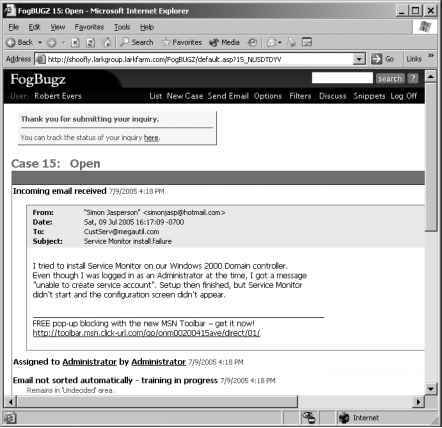 My second example highlights the e-mail management features of FogBugz. This time I'll follow what happens when a customer inquiry arrives by e-mail. Simon Jasperson, who happens to be a long-time user of MegaUtilities products, had planned to be an enthusiastic tester of Service Monitor. But when he tried to install the product, the installation failed. From reading the release notes with the beta, he knows that he can send e-mail to [email protected] describing his problem, so he does so. Back at MegaUtilities, Randy Wilson happens to be logged on to the FogBugz server when he notices a new case in the Inbox project. Any FogBugz user can review and deal with incoming mail, so Randy clicks through to the message. It looks like a legitimate bug to him, so he moves it over to the Service Monitor project and lets FogBugz assign it to the primary contact, Valerie Shriver. Meanwhile, FogBugz doesn't forget about the customer. Simon gets back an automatically generated e-mail that not only tells him his message has been received, but gives him a URL for tracking what's going on with it. Clicking through to the URL gives him a read-only view of the case, as shown in Figure 1-4. 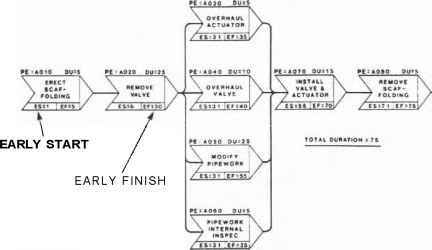 The bug proceeds through the usual process at MegaUtilities. Valerie adds a due date to the bug and assigns it over to Terry Eagan, another of her developers. Terry is pretty swamped right now, but she opens the bug and puts in an initial estimate of 6 hours to solve the problem. All of these changes continue to be reflected on the status page that Simon can check out, assuring him that the company is working on his problem. 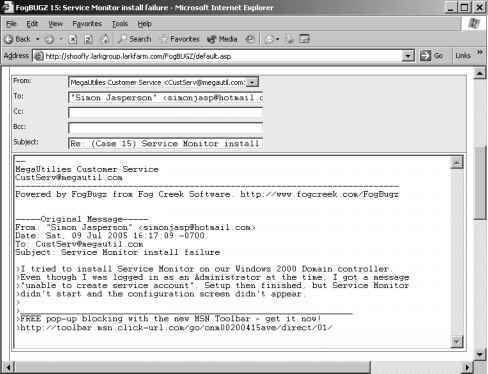 FogBugz administrator (because it can't be assigned to a customer). The administrator later signs on to look at the bug on behalf of the customer. Seeing that the bug is fixed, she clicks the Reply button in the bug's header, which automatically composes an e-mail back to the customer, as shown in Figure 1-5. The administrator uses this e-mail to close the loop back to the original customer, letting him know that the bug is fixed in the latest build, and then closes the bug.